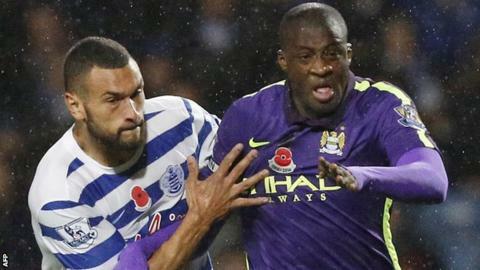 Yaya Toure has given a signed shirt to a five-year-old girl who was struck by one of his wayward shots in Manchester City's 2-2 draw at QPR on Saturday. The City midfielder was off target with his effort midway through the first half and Chloe Power, a QPR season ticket holder for two years, was hit in the face in her seat behind the goal. Following the game, Ivory Coast international Toure gave Chloe a shirt with the word 'sorry' written on it. He later said on Twitter: "Relieved to hear the girl my shot hit is OK. I was very worried." QPR also gave Chloe a signed shirt. City twice came from behind against QPR as Sergio Aguero's brace cancelled out Charlie Austin's strike and a Martin Demichelis own goal. Following the game, the west London club tweeted: "We've just spoken to the young girl who was hit by Yaya Toure's shot - she's fine and will enjoy these shirts!"